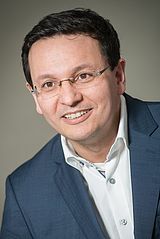 Vincent Heuveline is the Director of the Computing Centre of Heidelberg University. He is full professor at Heidelberg University where he leads the Engineering Mathematics and Computing Lab (EMCL) under the roof of the Interdisciplinary Center for Scientific Computing (IWR). Furthermore, he is the Group Leader of the research group "Data Mining and Uncertainty Quantification" at the Heidelberg Institute for Theoretical Studies (HITS gGmbH). His research interests include uncertainty quantification (UQ) in scientific computing, high performance and data intensive computing, and software engineering, with main application focuses in medical engineering and energy research. Besides lectures in scientific computing, he is strongly involved in teaching IT security - with both lectures and dedicated seminars - at Heidelberg University. He serves as a program committee member of several international conferences on high performance computing. He is widely consulted by the industry with respect to the deployment of numerical simulation, cloud computing and IT security in industrial environments.